You have to be careful when you tell someone that you are making this dish. Because if you say it too quickly, it sounds like "pinkeye chicken", which isn't too appetizing. But appetizing it is! This is a dish we found years ago on BigOven. It was good back then when we made it with sweet chili sauce but now that I use sriracha sauce in it, this Laotian recipe is a superb grilled chicken with layers of heat and sweet. Rip of the top half of a bunch of cilantro. Don't be picky about some stems being included. 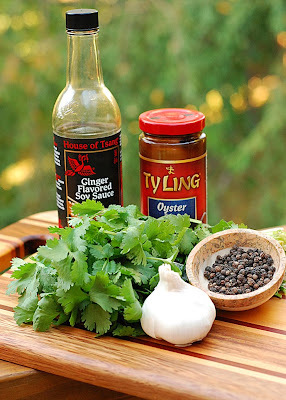 Finely chop the cilantro and garlic in a food processor. 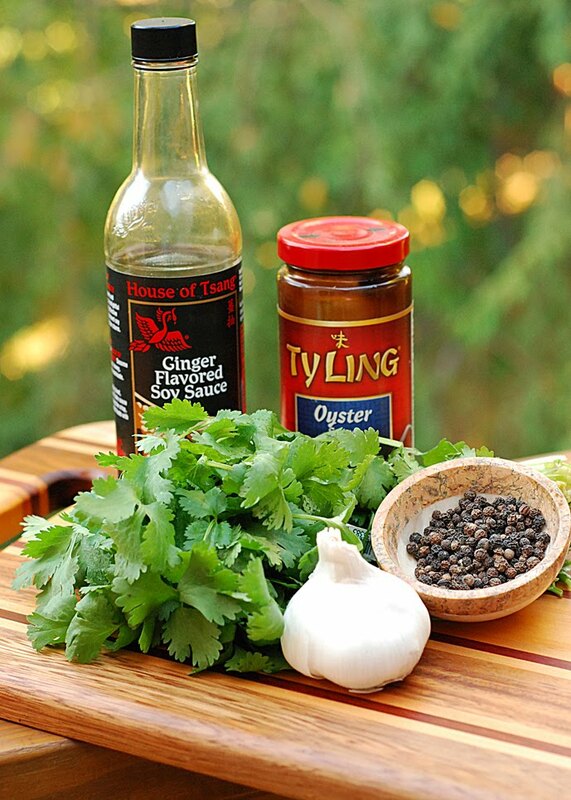 Add the oyster sauce, soy sauce, black pepper, and oil and pulse the food processor until mixed well into a paste. 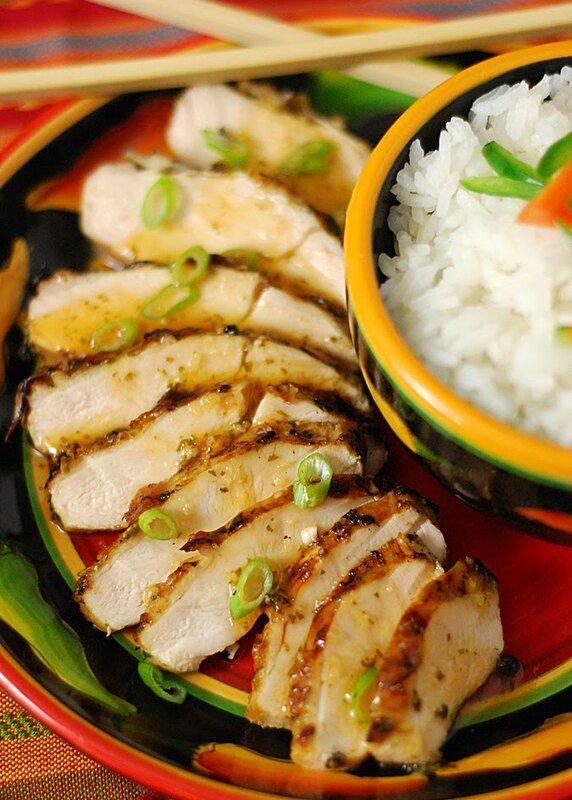 Rub the paste onto the chicken breasts and under the skin too. 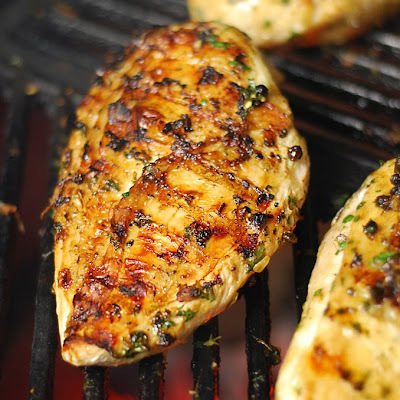 Let marinade for at least 1 hour or overnight if possible. In a sauce pan, heat the water and sugar until boiling, stirring often. Cook until thickened, about 10 minutes. Allow the simple syrup to cool. Then add to a food processor with the cilantro, garlic, vinegar, lime juice, sriracha, and fish sauce. Process until smooth. If still too thin, you can add 1/2 to 1 tsp of potato starch to thicken the sauce. Set up your grill for a direct heat cook at 350f. Place the chicken on, skin side down, for 8 minutes. Flip and cook for another 6-8 minutes, until the breasts hit an internal temp of 160f. Slice thin, garnish with sliced green onions and drizzle with the "dipping sauce". 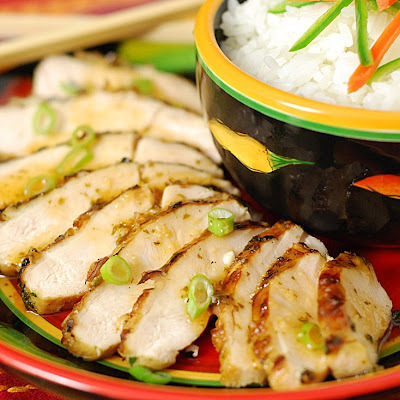 Serve with sweet Jasmine rice topped with slivers of carrots and jalapenos. On that note, we are heading out to the Eggtoberfest in the morning. Behave yourselves while we are gone and don't let Scott Baio give you pinkeye.